As frugal innovation and crowd sourcing were instances of efficient and effective scientific enterprise, innovation must drive the scientific process, Prime Minister Narendra Modi said on Saturday. "Innovation must not be the goal of our science. 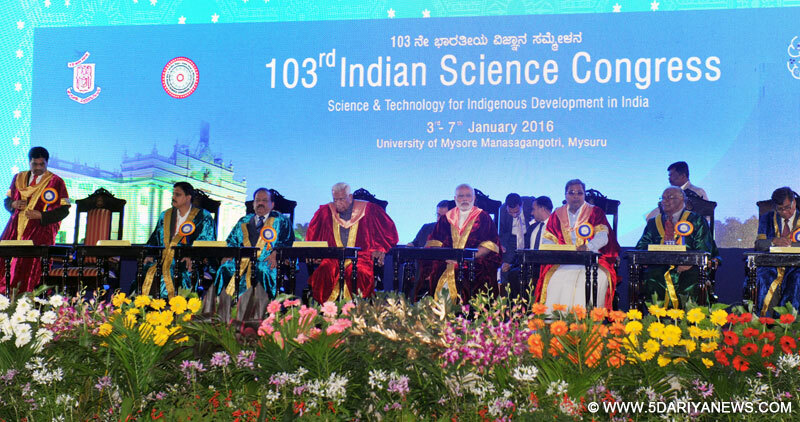 It should drive the scientific process, as it not an obligation of the government, but also the responsibility of the private sector and academia," he said, delivering the inaugural address at the 103rd Indian Science Congress being held in the sprawling Mansagangotri campus of University of Mysore here.He stressed that good governance was not about policy and decision-making, transparency and accountability, but integrating science and technology into choices to be made and strategies to be pursued.Noting that digital networks were expanding the quality and reach of public services and social benefits for the poor, he said the government had identified 170 applications in the national space conference, touching many aspects of governance, development and conservation. "As we increase the ambition level for our people, we will have to increase the scale of our efforts. We are launching Start-up India (on January 16) to encourage innovation and enterprise. We are also setting up technology incubators in academic institutions," he said. The prime minister also directed the science and technology ministry to draw an audit framework for scientific departments and institutions in the government. "It is with the same spirit of cooperative federalism that is shaping centre-state relations in every area. I am encouraging greater scientific collaboration between central and state institutions and agencies," he noted.Assuring the scientific community of increasing resources for science and deploying them in accordance with strategic priorities, he said science administration would be improved to make it easier to do science and research in the country and expand supply to improve quality of science education and research. "In a world of resource constraints and competing claims, we have to be smart in defining our priorities. It is important in India, where challenges are many and the scale is enormous - from health and hunger to energy and economy," he added.